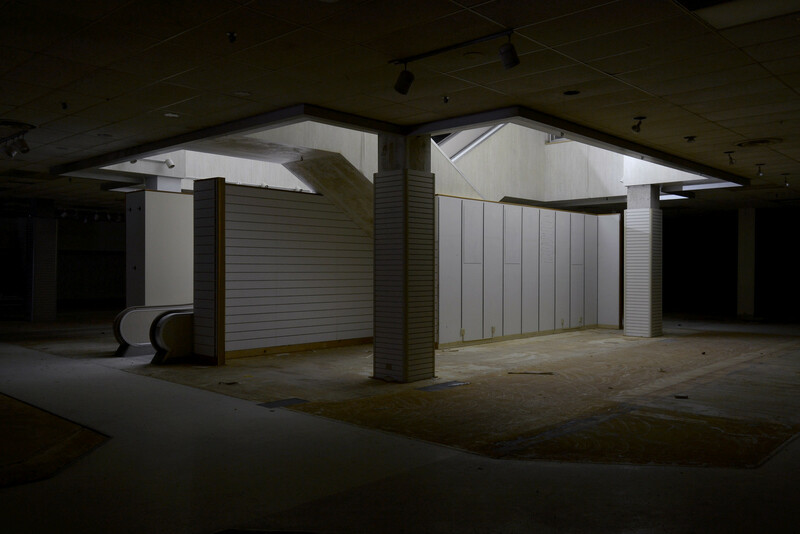 Pitch-dark, two-story JCPenney at Northridge Mall, north of Milwaukee. 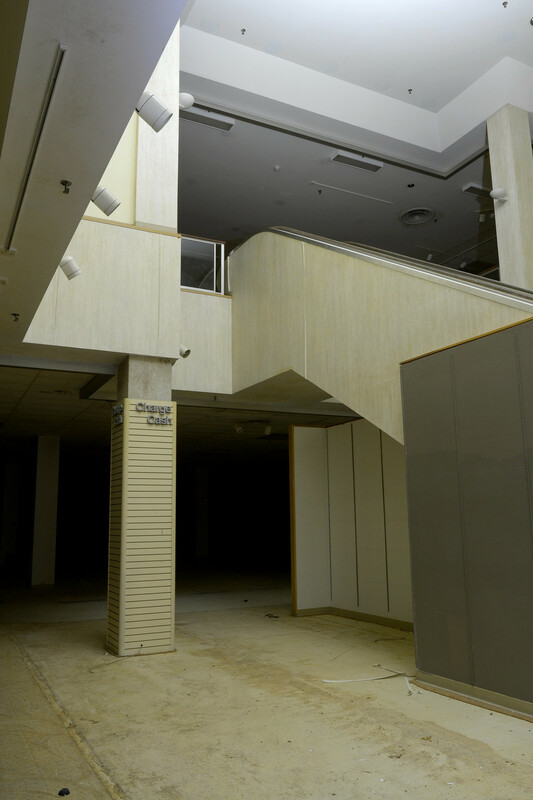 Shuttered during Bush II’s first term, Northridge has always been locked-down and guarded hard, making it one of – if not the best-preserved abandoned mall in the country. I had picked up a new flashlight for this occasion, and since I never use flash: was having some fun achieving different effects. All photos but the last were taken in 30-second long, single-exposures. The softer, almost-natural light in these first two was accomplished by reflecting it off the ceiling vs. light painting the entire scene. I put the camera on a 10s countdown and ran up to the second floor. The same concept was also applied, here, but by hiding with the light behind the wrapstand and bouncing the light off the floor. 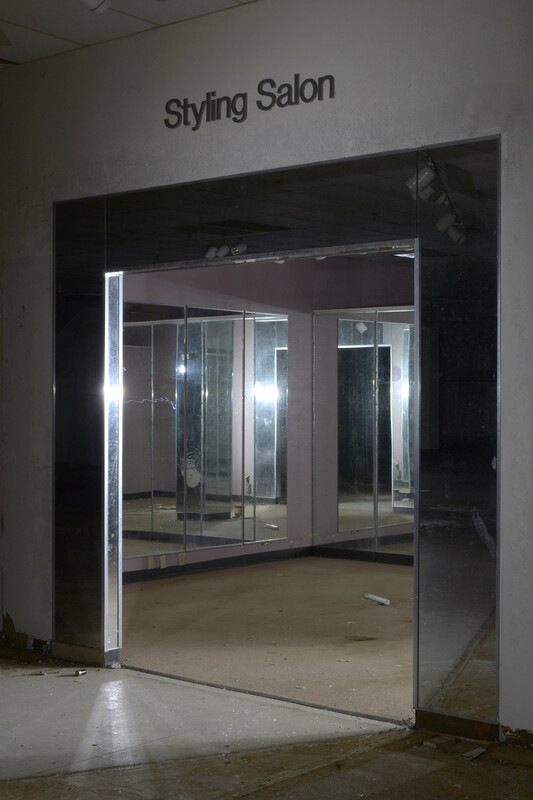 At the old beauty salon, I blipped the light just enough to catch the walls and mirrors surrounding the doorway, then went inside and painted the ceiling of the interior. It took several attempts to get a tasteful amount of lighting, here, but this one proved to be the most-polished turd. I spent much time trying to apply the same concept to the portrait studio, but after several attempts to paint the interior I decided it was too boring with all the equipment inside long-gone. Instead I opted to wave a red LED around manically for the duration of the exposure; I always hated picture day at the Sears studio when I was a kid, so I think this end result sums up my childhood frustrations with them. 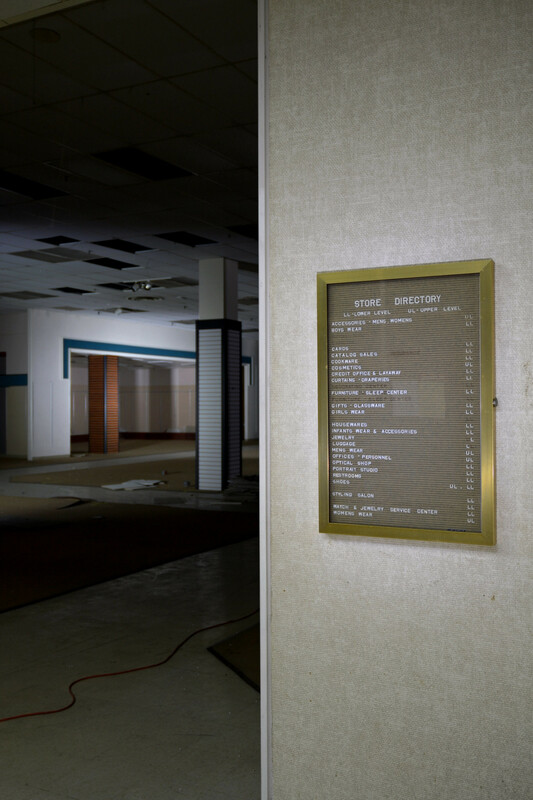 At one of the store entrances was a directory, preserved from when the store closed. 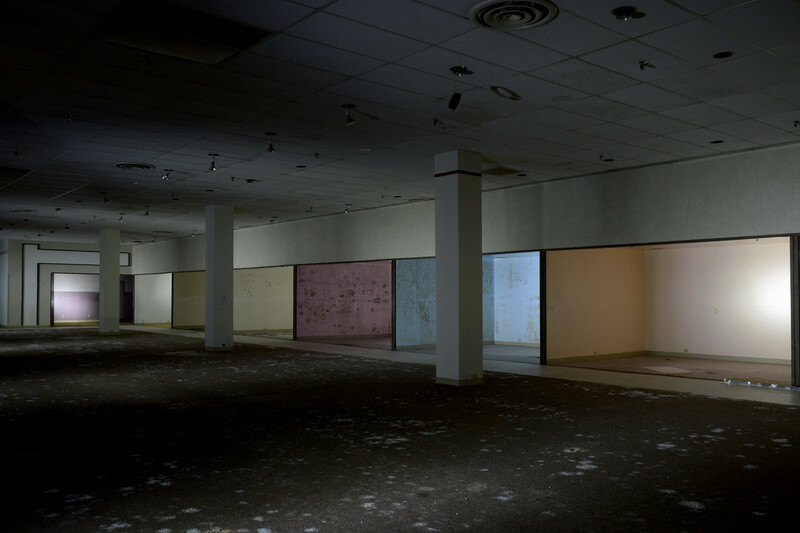 Three of the four techniques mentioned so-far were applied to light the directory, wall, and the unknown department in the background. 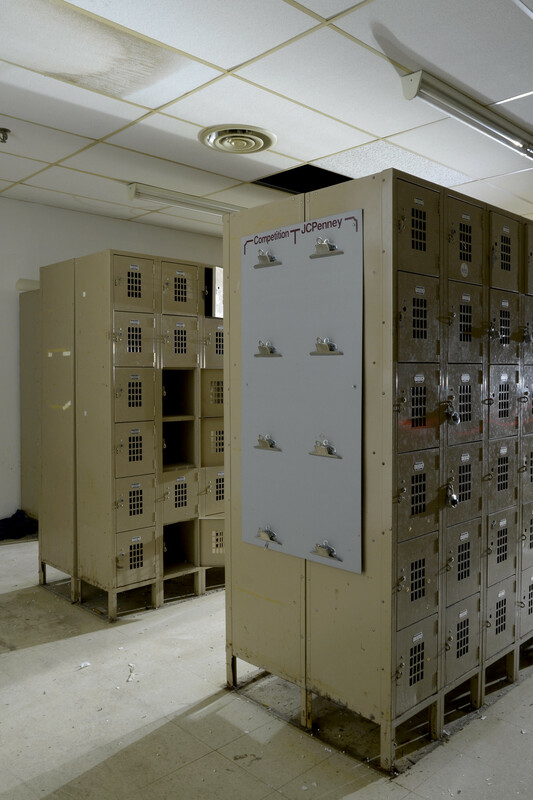 Deeper into the store’s employee corridors were the lockers, some still contain employee belongings. To light this, I stood behind the lockers and, from the aisles: light-painted the wall behind the camera – using the reflection to softly illuminate the scene. 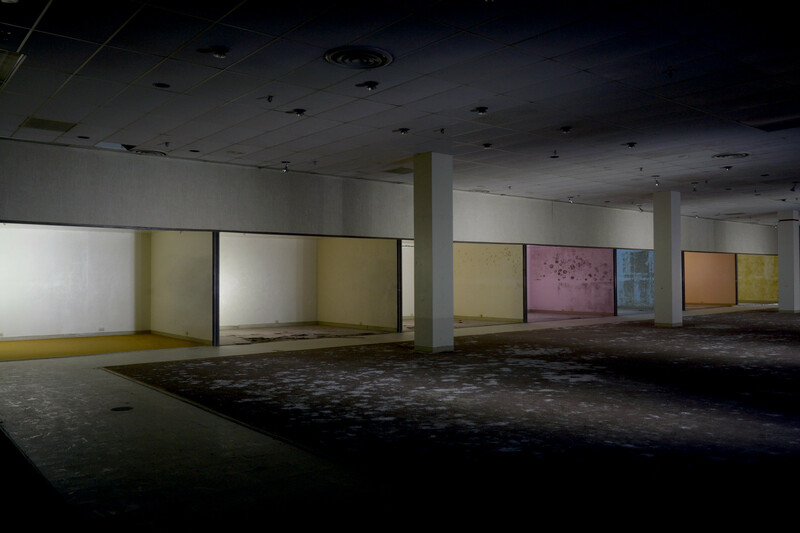 This colorful part of the store was its home decor department, originally branded as the “Home Fashion Center”. 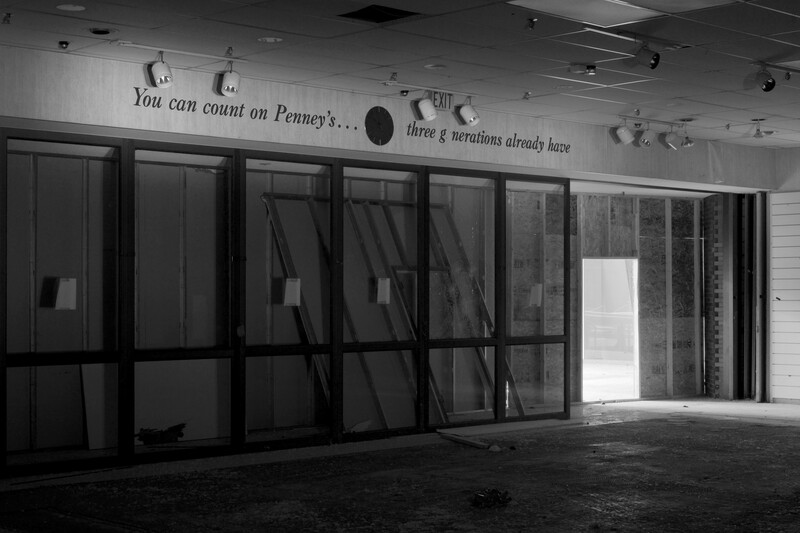 It was a bit of a familiar sight to me, as the store at Dixie Square Mall also had the same design – albeit still decked in 60s or 70s wallpaper, where this store lived long-enough to see another remodel or two. 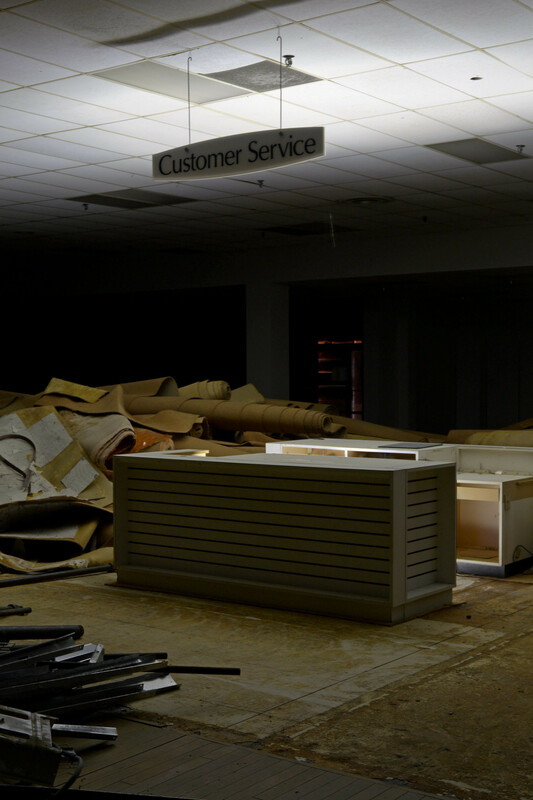 The lighting here was achieved by running a lap around the entire department, painting various areas as I went. I hit the carpeted area in the foreground first, out of camera-view, then walked into the scene and painted each box as I went, taking care not to get the flashlight in direct-view of the exposure. This worked almost perfectly, however I still wound up cleaning some streaks in Photoshop. 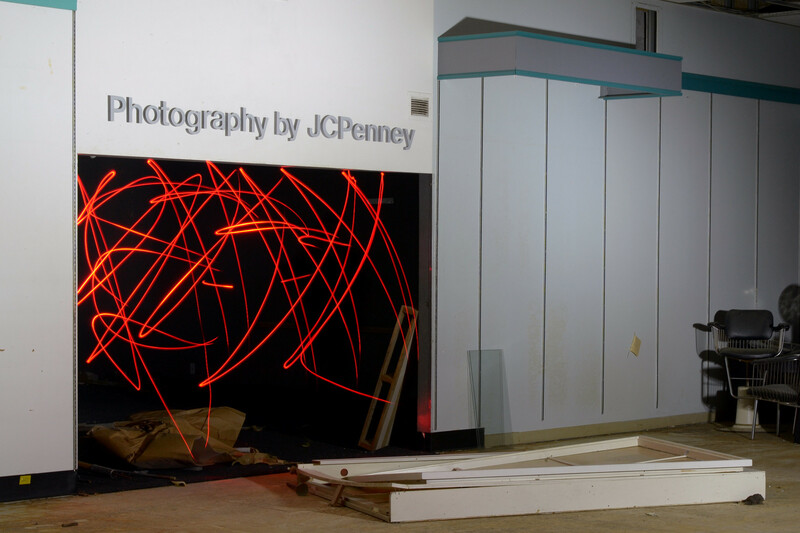 This last scene, at the mall entrance, is a combination of light painting the (long-dated) slogan over the entryway, natural light from the mall, and bracketing to ensure the natural light didn’t wash-out the doorway. This mall has a former Gimbel’s/Prange’s/Marshall Field’s/Younker’s anchor that’s also accessible, in the near-future we’ll be back here to take this a little further.